What Are Mobile or SMS Keywords? One of the new terms you'll begin hearing more and more in the mobile marketing world is "mobile keyword", “sms keyword” or “text keyword”. 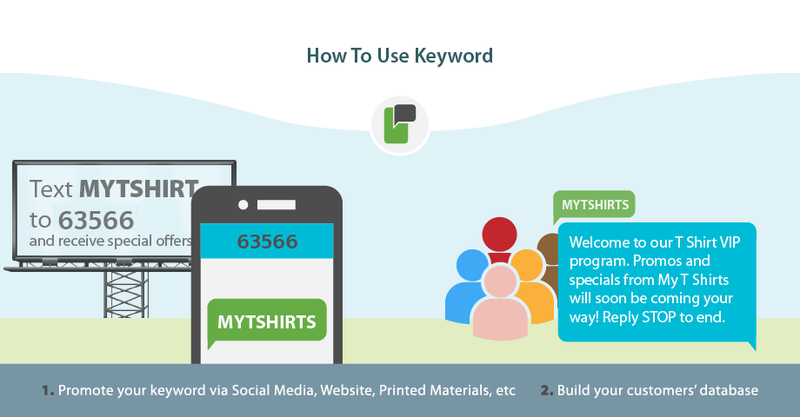 A mobile keyword is a single word that can contain letters or numbers and is picked by a business as the word to be sent via text message to a short phone number called a "short code". The purpose being that the person sending the keyword is volunteering to join a text messaging list or enters into an interactive SMS campaigns. How can Text Keywords be used? Do you need more leads? Or maybe you need more client’s data? Promote your keyword via Social Media, Website, Printed Materials, TV and Radio commercials, Billboards, Brochures, Podcasts, eBooks, Sweeps Campaigns, etc. ... and then later, send alerts, promotions, greetings to all of your clients. ... or enter them into a DRIP SMS Campaign, which is a unique way to boost your sales and brand recognition.